Coastal resources already face many human-caused stressors such as fishing pressure, pollution and land use change. Climate change will exacerbate these existing stressors and put coastal species and habitats at further risk. Coastal stewardship can help reduce human impacts on marine ecosystems, increasing their resiliency and adaptive capacity to climate change and other stressors. Further, individual action and adhering to sustainable practices strengthens ongoing conservation and adaptation efforts. Climate change has already impacted fish and invertebrate populations in the ocean. From fish shifting their distributions northward, to declines in invertebrate populations due to ocean acidification, climate change impacts exacerbate existing human-caused stressors, putting our marine resources at increased risk. Explore and download data on how the climate has already changed and is projected to change in local, regional, and global oceans and marine ecosystems using NOAA's Climate Change Web Portal. 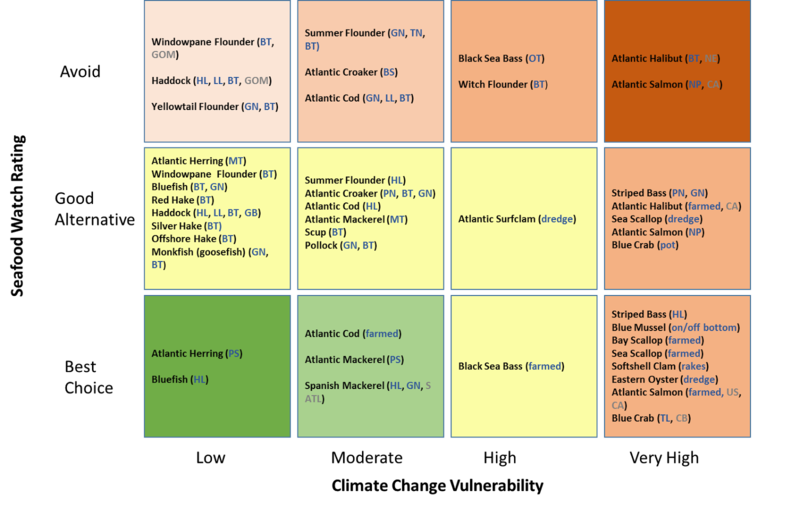 Explore and download data on specific species of marine fishes and invertebrates and learn how their populations have already shifted in response to climate change on the Ocean Adapt website. Learn about priority needs and specific actions in coastal and marine ecosystems by exploring the Northeast (NEFSC) Regional Action Plan. Explore, interact, and implement actions using a range of climate adaptation tools from the Climate Resilience Toolkit and the Sea Grant Resilience Toolkit. Ninety percent the world’s fisheries are now fully exploited, over-exploited, or have collapsed 4. Overfishing, lack of effective management and human consumption are just a few factors contributing to these declines. Climate change will further impact fish populations in various ways, depending on species and habitat conditions 2. In order to reduce human impacts on global fisheries, it is important to purchase and consume seafood that was legally, sustainably and locally harvested whenever possible. A list of sustainable seafood choices can be found on the Monterey Bay Aquarium Seafood Watch website. Use the mobile Seafood Watch app to get the latest seafood recommendations. When shopping for seafood, consumers can also look for the blue MSC label for Marine Stewardship Council’s certified sustainable seafood. Other sustainable seafood resources include Sea Choice and the Aquaculture Stewardship Council. Learn more about threats to marine wildlife and how purchasing MSC certified food can help conserve ocean resources through the World Wildlife Federation. The matrix above shows climate change vulnerability rankings as defined by Hare et al. (2016) and Seafood Watch ratings designated by the Monterey Bay Aquarium of common commercially and recreationally targeted fish in the U.S. Atlantic. Gear abbreviations: bottom trawl (BT), gillnet (GN), handline (HL), otter trawl (OT), longline (LL), net pen (NP), beach seine (BS), midwater trawl (MD), pound net (PN), trot line (TL). Location abbreviations: Canada (CA), Gulf of Maine (GOM), New England (NE), Georges Banks (GB), South Atlantic (S ATL), United States (US), Chesapeake Bay (CB). Consuming locally harvested food further supports conservation efforts by reducing carbon footprint from transportation energy. Dunes are important natural features that protect terrestrial habitats and built infrastructure from ocean waters and storms. Dunes are often enhanced through dune and beach nourishment projects to increase their protective capacity. Walking on dunes can degrade their protective capacity by increasing erosion. Walking on dunes can also damage native vegetation, which is important for binding and securing sediment, helping prevent erosion. Native vegetation that occurs in the intertidal zone is important for sediment stabilization; walking on and disturbing this vegetation can reduce its ecological function and protective capacity. Walking on dunes may also disturb and put nesting shorebirds and other wildlife at increased risk. Many wildlife species that live throughout coastal ecosystems are sensitive to human disturbances. For example, migratory shorebirds nest on beaches and can succumb to injury or death, especially in areas with high pedestrian foot traffic. To increase the resiliency and adaptive capacity of these species to climate and other human-induced stressors, it is important to avoid areas where nesting occurs, particularly during the breeding and chick rearing season. Other species that may be encountered in coastal habitats include terrestrial mammals, terrapins, crabs, and fish. It is important to leave wildlife in their natural environments, and to avoid any type of disturbance. Citizen science is an important way for the public to participate and contribute to improved understanding of climate change impacts. One such effort is being led by the National Phenology Network. As the climate continues to change, so is the timing of recurring seasonal life events in many plants and animals. Phenology is the study of cyclical changes in seasonal events, and how they relate to shifting climate and ecology. For example, many coastal fish and wildlife species, particularly shorebirds and sportfish, migrate long distances to Massachusetts and the greater Northeast US, to use seasonally abundant food resources in support of raising their young and as energy as they make their way to other parts of the world. If the timing of a necessary resource is not synched to the timing of animal migrations, a mismatch could occur, resulting in poor energetic reserves, decreased fitness, as well as broader ecosystem level effects. Climate-induced changes in coastal phenology are one of the most poorly understood responses to climate change. Help improve records on when and where fish and wildlife occur by participating in a National Phenology Network (NPN) campaign. Climate change may be impacting sea turtles, marine mammals, and other fish and wildlife species in complex ways, and could be directly or indirectly increasing the number of stranding events, depending on the species and location. Sea turtles are vulnerable to stranding events when exposed to long periods of cold temperature, where they may become “cold stunned”. This may occur more in habitats and seasons of drastic temperature changes such as the Northeast US. Climate change may impact rates of cold-stunning due to changes in the timing of food availability from changes in phenology. For example, if sea turtles are foraging inland in the fall when temperatures start to drop, they may cold-stun and be blown ashore 5. For some marine mammals, a low volume of ice has been correlated with the number of stranding events 3,6. Other biological factors such as forage abundance, algal blooms, and temperature changes appear to further impact marine mammal standing events. Large scale climatic events such as changes in wind, water temperature, and nutrient patterns have been shown to impact whale strandings in particular. Find local and regional stranding networks and report stranded marine mammals and turtles. Although the ocean may seem inexhaustible, it is in fact limited. There is global demand for fish and other marine resources for food, protein, and economic gain. Therefore, conservation and sustainable practices are key to ensure these resources remain for future generations. State and federal resource agencies collect information and manage commercial and recreational fishing in coastal waters in order to protect and conserve fish populations. Size limits, seasonal closures, and gear restrictions are common methods used to track and regulate the harvest of marine resources so that they have the resilience and adaptive capacity to sustain under future and uncertain conditions. It is important to follow these guidelines to ensure healthy fish populations for future generations. 1. Evans K., R. Thresher, R.M. Warneke, C.J.A. Bradshaw, M. Pook, et al. 2005. Periodic variability in cetacean strandings: links to large-scale climate events. Biol Letters 1:147–150. 3. Johnston D.W., M.T. Bowers, A.S. Friedlaender, D.M. Lavigne. 2012. The effects of climate change on harp seals (Pagophilus groenlandicus). PloS ONE 7(1): e29158. DOI:10.1371/journal.pone.0029158. 6. Truchon, M.H. et al. 2013. Marine Mammal Strandings and Environmental Changes: A 15-Year Study in the St. Lawrence Ecosystem. PLoS ONE 8: e59311. doi:10.1371/journal.pone.0059311. Click link above to view references. Bookmark your favorite pages here. See the "add this page link" to add a page to your favorites. Click the X to remove a page from the list.